they happily look back to better times, recapturing some of the feel-good essence of the past. "Yes! - Cajun with REAL panache." .... Bruce MacGregor BBC Radio Scotland. Formed when founding members of two of the mightiest forces in American roots music - The Red Stick Ramblers and The Pine Leaf Boys - came together, they have unashamedly re-visited ‘50s swamp pop stylings, to fill some of the best-known dance halls of Southwest Louisiana…and emerge as new ambassadors for the music. 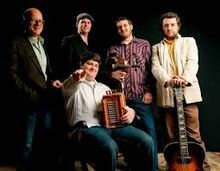 "If you've ever been nagged by the feeling that all Cajun and zydeco music was starting to sound a bit too much like the same old thing, The Revelers will toss that notion back on your ears. This is Louisiana-bred party music sustained by the sonorous signature of its native milieu, but perked up by an injection of contemporary pop, rock and R&B"